The Japanese government says that a worker at the Fukushima nuclear power plant died as a result of radiation exposure. It's not clear precisely when the man died. He was in his 50s, NHK said, and his duties included "measuring radiation levels at the plant immediately after the severe nuclear accident." He left his job there in 2015, and was diagnosed with lung cancer before his death. The ministry said that he "developed cancer due to total radiation exposure of around 195 millisieverts," NHK reported. According to Reuters, exposure to 100 millisieverts of radiation in a year "is the lowest level at which any increase in cancer risk is clearly evident." The earthquake and tsunami killed approximately 19,000 people, as NPR's Elise Hu reported, and "most drowned within minutes." The radiation plumes caused by Fukushima's meltdowns spread up to 25 miles away, she added. 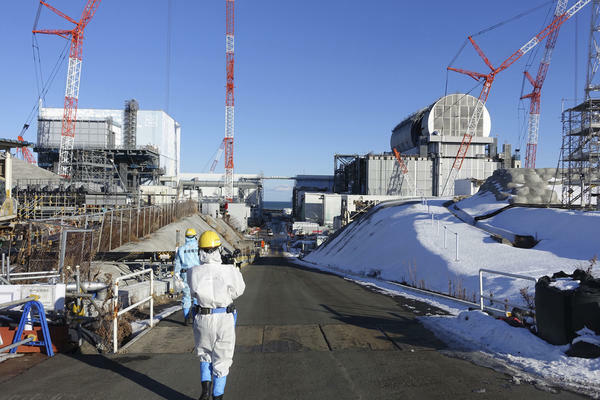 And while this is the first fatality that was attributed to radiation, NHK says four workers who have cancer have been deemed eligible for compensation. One of them, who is suffering from leukemia, was awarded compensation last December, according to The Asahi Shimbun. He "was engaged in emergency operations to send water to cool the reactor containment vessels and assess the extent of damage," the newspaper said, and did so for months after the disaster started. As workers report cancers that could be linked to radiation exposure, it's difficult to prove that the meltdown is definitely the cause. At least five applications for compensation have been denied, according to the Asahi Shimbun. As Nature reported in 2012, two assessments by the United Nations Scientific Committee on the Effects of Atomic Radiation and the World Health Organization concluded that "few people will develop cancer as a consequence of being exposed to radioactive material ... and those who do will never know for sure what caused their disease." The U.N. report "shows that 167 workers at the plant received radiation doses that slightly raise their risk of developing cancer," the journal wrote. At the same time, for those workers, "future cancers may never be directly tied to the accident, owing to the small number of people involved and the high background rates of cancer in developed countries such as Japan."